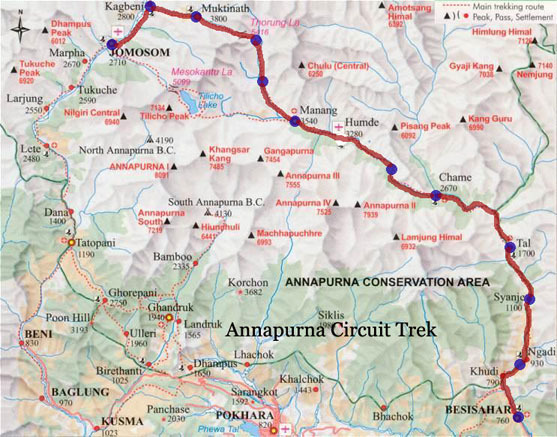 The Annapurna Circuit has been considered one of the best trekking/hiking trails in the world, and is the classic long distance, high altitude trek in the Annapurna region. The trek is one of contrasts between the green, terraced farmland of the Marshyangdi valley and the semi-arid environs of Lower Mustang. The two areas are separated by the Thorong La pass (5416m), which we must cross on a long day, to reach the sacred site of Muktinath. 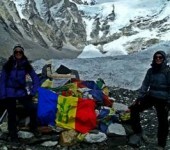 The temple complex is a pilgrimage site for both Hindus and Buddhists and when seen from here the sunrise on Dhaulagiri is particularly striking. 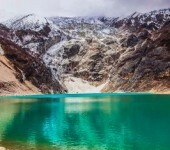 This 17 day variation of the Annapurna Circuit trek follows the same route as the traditional trek as far as Jomsom where the trek ends with a return flight or drive to Pokhara. 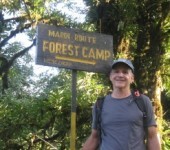 Like the full 23 day Circuit trek we can diverge from the standard itinerary occasionally to take the new trails that are being constructed away from the roads that now go as far as Chame. Alternately we can take a jeep from Besi Shahar part of the way to avoid walking along the roads and to give us more time for trekking along the higher section of the route. 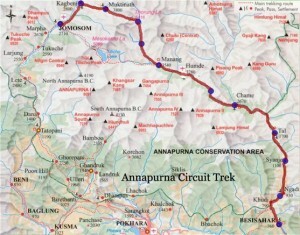 The Annapurna Circuit is a classic trek on ancient trade routes. Ascending the Marshyangdi valley. 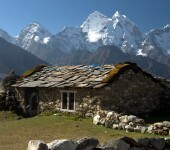 Passing Manaslu and Hinchuli. Visit old Buddhist monastery in Braga. Explore beautiful Manang village. Crossing the Thorung-La (5416m). The Pilgrimage town of Muktinath, View of Dhawagiri Ice-flow. 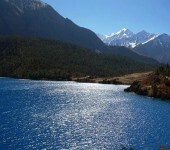 At the Thorung La pass, with its traditional prayer flags and stone cairn we will have outstanding views. 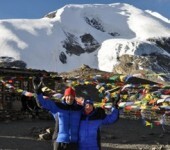 You can see the Annapunas, Gangapurna and Khatung Kang, a heavily glaciated peak. Amazingly there is a teashop here on top of the pass at 5416 meter. From here we start a long descend of about 1600 meter with outstanding views of Dhaulagiri mountain standing alone in the distance across the valley. After the trail becomes less steep we will enter grassy fields and cross meadows to our final destination of Muktinath, which means place of Nirvana and is home to the Muktinath temple as well as several monasteries. It is said that all sorrows you feel are relieved when visiting the Temple, which is a scared pilgrimage site to both Hindus and Buddhists. The main pilgrimage normally takes place in September. The Temple is dedicated to Lord Vishnu and has 108 waterspouts around it from which Holy water pours. Another attraction nearby is the Jwala Mai Temple and this contains a spring and an eternal flame fed by natural underground gas (9 hrs). 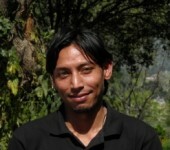 From today we will follow the “Jomsom trek” in reverse order. We will first make a 990 meter descent through meadows, streams and fruit orchards down to Kagbeni, a fascinating medieval village infused with Tibetan culture. Then we will continue going down the Kali Gandaki gorge to Jomson (more correctly Dzongsam, or “new fort”). Fly to Pokhara and spend the day at leisure, relaxing, and maybe enjoying a massage or enjoy sightseeing around Pokhara valley. 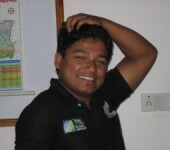 Overnight in Pokhara. Day 16 – Fly or drive back to Kathmandu.